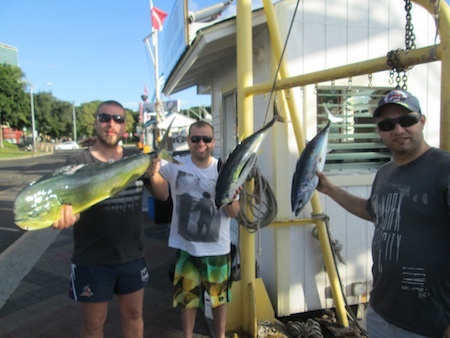 Ben, Robert and Jason with their catch! 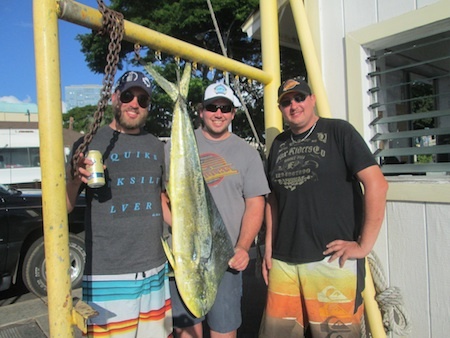 Mahalo to Ben, Robert and Jason for choosing Maggie Joe Sport Fishing! 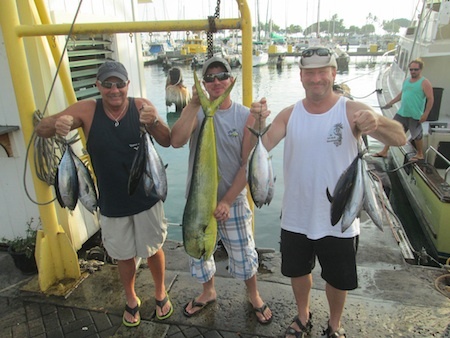 They hauled in a Mahi Mahi and 10 Shibi’s while deep sea fishing off Honolulu, Oahu! Aloha! 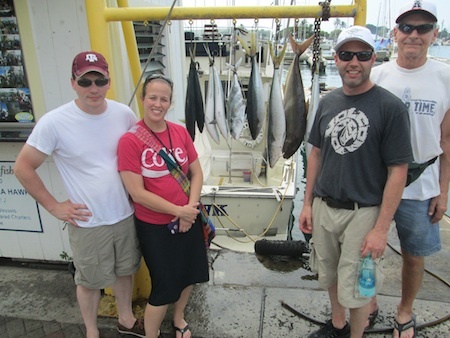 Dixie, Mike, Frank, Robyn, Cody and Dan with their catch! 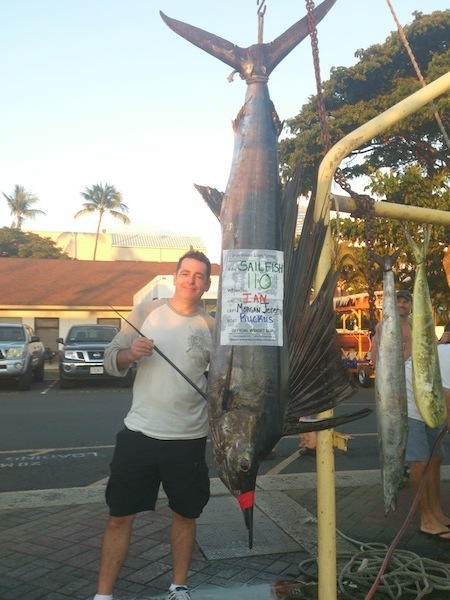 Mahalo Ian for choosing Maggie Joe Sport Fishing! He joined Captain Matt aboard the Ruckus and hauled in this nice 110 lb Sailfish while deep sea fishing off Honolulu, Oahu. Aloha! Rani, Louie and Neil with their catch! Big Mahalo to Rani, Louie and Neil for choosing Maggie Joe Sport Fishing! The group hauled in some Rainbow Runners, a Tagami and an Amber Jack while deep sea fishing aboard the Ruckus. Aloha! Mahalo from Travis, Doug and John who joined us all the way from Canada. They hauled in a Mahi Mahi while deep sea fishing with Captain Morgan aboard the Ruckus. Aloha! Ryan, Bob, Apeie, Eddy, Andy and Laura with Shibi and Aku! 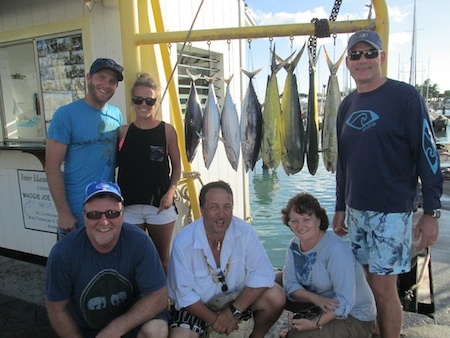 Mahalo to Ryan, Bob, Apeie, Eddy, Andy and Laura for choosing Maggie Joe Sport Fishing. 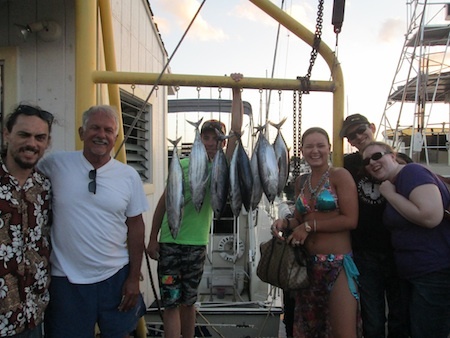 The group hauled in a boatful of Shibi and Aku while fishing aboard the Ruckus. Aloha! Mahalo to George, Rob and Mario who joined us all the way from Australia. They caught a Mahi Mahi, a Shibi and an Aku aboard the Maggie Joe while deep sea fishing with Captain Matt. Aloha!